Pig out at Good Shepherd Parish, St. James location. 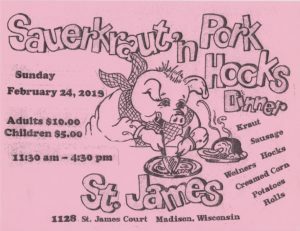 Enjoy Sauerkraut, Pork Hocks, Sausage, Wieners, and all the fixings. Beer, Soft Drinks, and Dessert available. Dine in or takeout.